Whether you are an early bird or you enjoy a lie in, breakfast and lunch are both key ingredients to a successful day in Rotterdam. 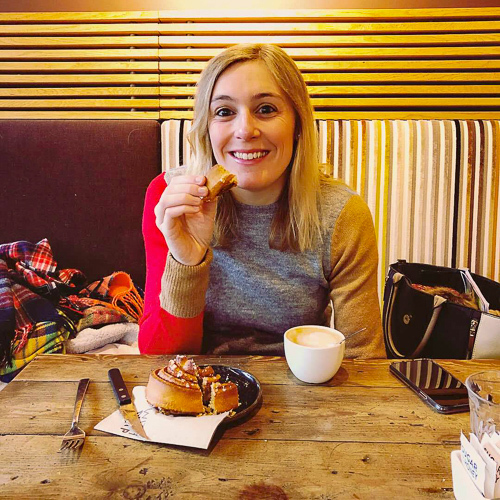 Food is high on the agenda wherever I travel, so it comes as no surprise that I had planned my city break around eating. Located on the western side of the Netherlands, this cosmopolitan city has iconic architecture and a fantastic food scene to suit everyone. Situated on Nieuwe Binnenweg, this coffee house is the perfect go-to for an all-day breakfast. With doors opening at 8.00am every day and no table reservations, it’s a popular choice for locals. I recommend arriving early to secure yourselves a seat. Trust me; you do not want to miss out! 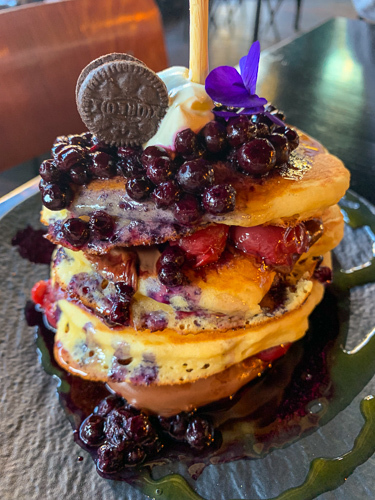 Here you can choose from a selection of American pancakes, eggs benedict and eggs florentine, as well as lighter options such as homemade granola and acai bowls. Stacks of pancakes are topped with crispy organic bacon, spinach, smoked salmon, goats’ cheese or fresh fruit. I opted for 4 fluffy pancakes with maple syrup, warm blueberries, cherries, and sweet Nutella. The pancakes were light and delicate in flavour and served with individual layers of fresh blueberries and cherries. Warm Nutella cascaded down the pancake stack, forming a small pool of chocolate at the bottom. Maple syrup was drizzled around the plate for decoration but the whole flavour combination worked a treat. 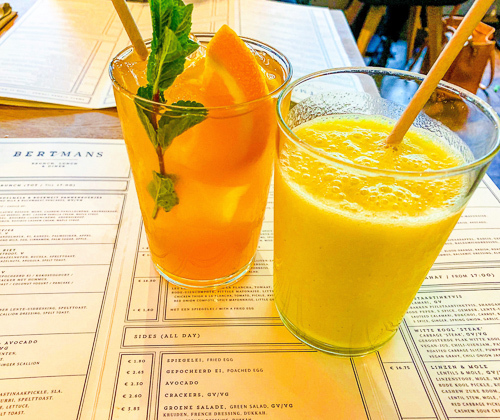 New on the Rotterdam food scene is Bertmans: a fresh, modern, hipster restaurant serving gluten-free, organic and vegan food. 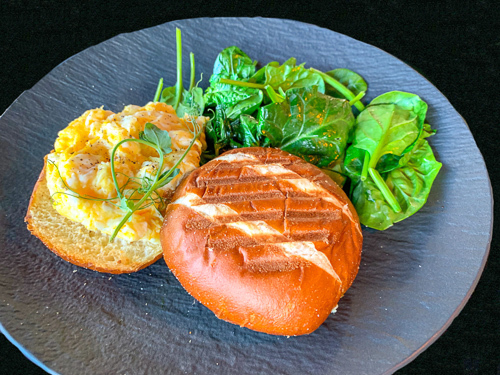 The menu has a vast selection of nutritious and healthy options for both brunch and lunch. As you enter the restaurant you witness chefs freshly preparing ingredients in the kitchen and cooking in front of guests. The décor and ambience is warm and cosy, with natural light from external windows, downlighting and large tropical plants close to tables making you feel as though you are in a sub-tropical destination. You can choose from a selection of fresh fruit juices, smoothies, cocktails or hot drinks. On the day I visited, I was really craving a refreshing cold drink, so I picked an orange, lemon, banana, mango and mint smoothie. I will be honest; I have gone 30 years without drinking smoothies, as I have never liked the texture. However, since visiting Bertmans, I am officially converted. This smoothie was delicious, so fresh, juicy and nourishing. In fact, as soon as I finished it, I wanted to order another glass. I chose the spelt bread as a starter, which was served with an eggplant tomato stew, chickpea and yoghurt carrot dip. 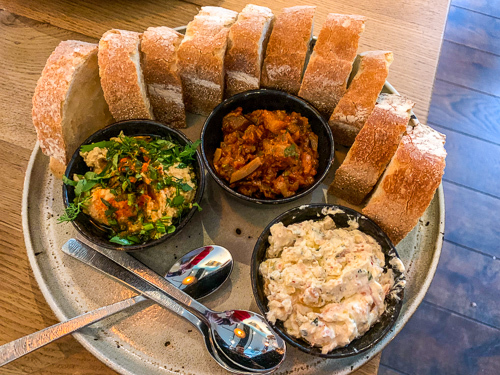 The rich, nutty taste of the bread really complimented the 3 dips that accompany it. This is the perfect sharing platter for two. For main, I opted for a falafel bowl. Portion sizes are large and at a price of €13.75 it’s an absolute steal. 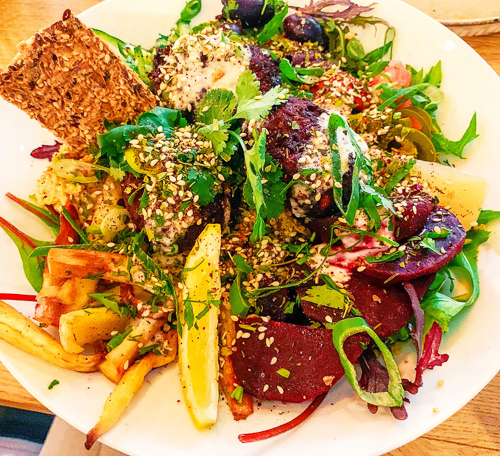 Three large pumpkin falafel balls were placed in a bowl of mixed salad leaves, artichoke quinoa, sliced red beetroot, roasted parsnips, pickles, olives, hummus with tahini and za’atar, topped off with a crunchy seeded crispbread and little slice of lemon. This is the perfect course to ensure you eat your 5a -day. Superb service, attentive staff and fantastic food. I love nothing more than finding a quaint bakery with freshly baked pastries and bread for breakfast. This place is special to me, as it’s where I tried my first cappuccino while munching on a cinnamon-caramel bread roll. Layers of sweet pastry are rolled, baked and encased with dark brown glazed pieces of caramel and spread with cinnamon and sugar. This family-owned café and bakery has tasteful interiors, an innovative menu in a newspaper format with piping hot coffee and freshly squeezed orange juice. 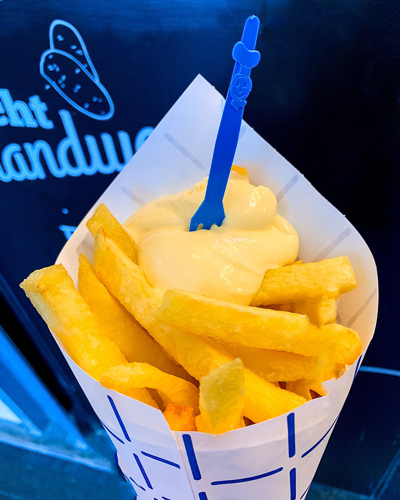 Vlaamsch Broodhuys is a small chain which is renowned for its “pain-grand-mères’” with its coarse crust, and firm texture. This whole-wheat bread is crafted using Camp Remy flour and is recognised as being one of the finest sourdoughs in the Netherlands. As you enter the bakery you are greeted by the sweet smells and aromas of every breakfast treat you could wish for. There is a superb selection of fresh breads, pain au chocolat, Koffiebroodjes, croissants, apple turnovers and Kaasbroodjes to choose from. You can then decide to dine in or take your goodies home. If there is one thing that you do when visiting Rotterdam, treat yourself to breakfast here and start your day the best way possible. Now, everyone loves a food market, but I honesty have never seen one so beautiful. 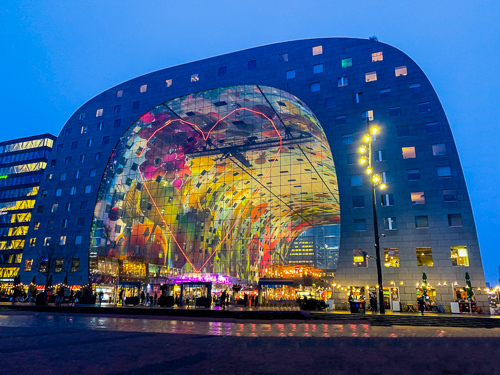 The Markthal combines luxury accommodation, a supermarket, numerous restaurants and an indoor food market, as well as below-ground parking spaces. 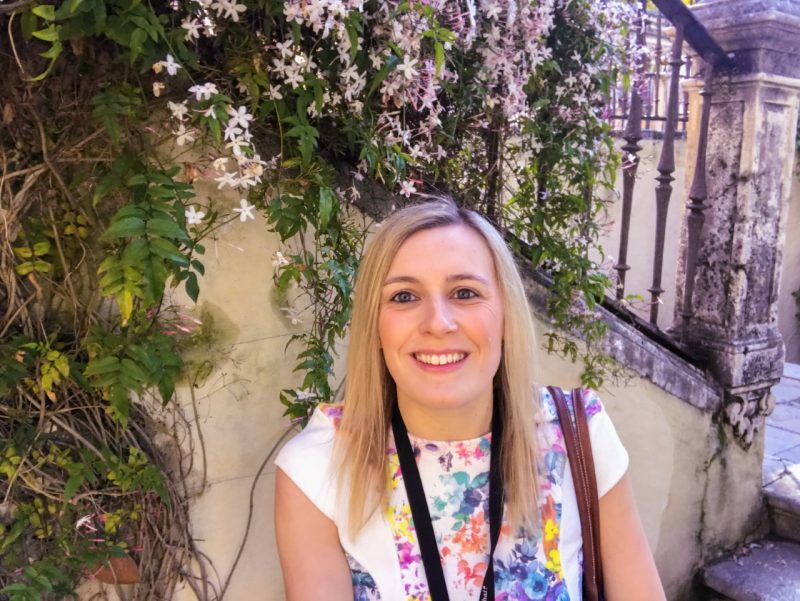 There are 96 fresh food stalls and shops to choose from, with fresh meats, cheeses, fruit and vegetables, pastries and cakes as well as local delicacies. I suggest visiting when you are hungry as the majority of stalls offer samples of stroopwafel, cured ham, and cheese to tantalise the tastebuds and entice you to buy more. Some of the food stalls offer a roof terrace where you can purchase a fresh cappuccino or cold drink and watch the hustle and bustle of the market below. It is the perfect place to sit back and relax. One of my favourite food stalls is Bram Ladage. Here you can sample a bram, which is a Dutch favourite cooked fresh to order. Crisp on the outside and soft inside these patats are moorish, especially with a serving of mayonnaise. You can opt for a small or large cone and can even choose a dollop of peanut sauce if you wish. Servings are plentiful so I suggest opting for a kinder bram (small). This is comfort food in a cone but boy is it good. Sandwiches are the key to my heart. I could eat them at pretty much any time of the day or night. 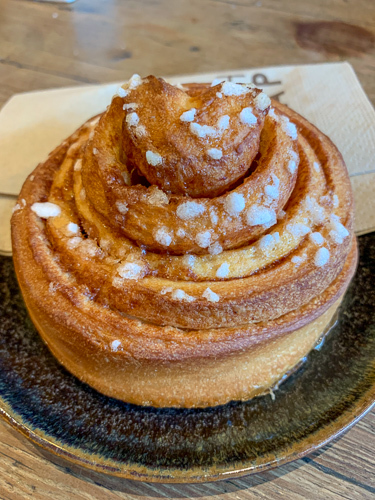 So, when it came to visiting Rotterdam and making a list of must-see food destinations, Baker and Moore came in at the top. This small, independent, rustic café is a 10-minute walk from the city centre, with an award-winning sandwich menu. Choose to “build your own” sandwich or pick from the fantastic range of specials, all made to order with fresh ingredients. There is a great selection on offer for vegetarians and vegans or those with food intolerances. This hipster venue really does have something for everyone. I was there to try the “Mr Baker Goes Asia” which had recently won an award for the Best Sandwich in the Netherlands 2018. Now, this is not a sandwich choice I would ordinarily have chosen. 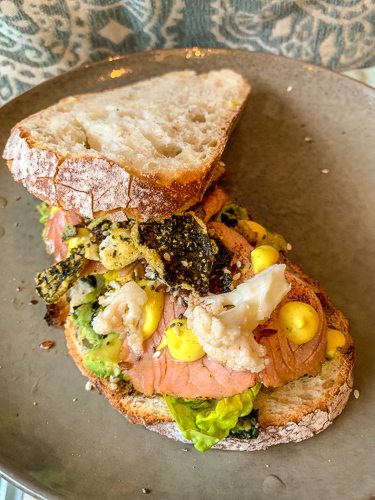 Avocado nori mash was paired with succulent pieces of flamed salmon, pickled cauliflower, curry mayo with a crumble of buckwheat and linseed on fresh B’rustiek bread. However, this distinctive sandwich really hit the spot. It was light, healthy and nutritious and had unique flavour combinations incorporating both sushi and sourdough bread. This sandwich creation is one of a kind, and really does deserve recognition for its flair and originality. If you want to try something spectacular, without having to travel to Asia, then this sandwich is your go-to lunch. Fascinated by the Netherlands and what Rotterdam has to offer, then a trip to Amsterdam should also be on your travel bucket list. *AD* I was invited to Bertmans by Rotterdam Partners. All opinions and photographs are always my own.